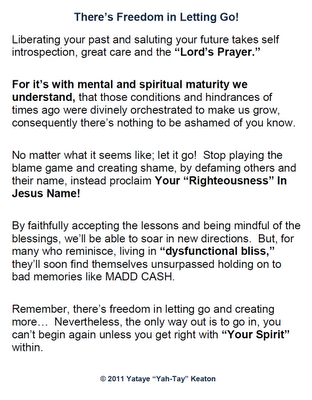 Talk With Yah-Tay: There's Freedom in Letting Go!!!! This morning, Mr. Steve Harvey tweeted, “Reconcile with Your Past & Let it go!” Powerful… Simply Powerful!!! This isn’t something that’s new, we ALL know the deal. In order to heal, FIRST, we must forgive ourselves and then the offender(s). Forgiveness is for YOU! You must forgive so that You Can LIVE.... Live in the PRESENT! When you're not at that place, it truly affects everything in your life. We must not only forgive, but also "Reconcile with our Past" as Mr. Harvey mentioned. You can't move forward looking in the rear view mirror, nor can you move forward if you are constantly holding on to the things of your past. At some point, you have to release it, let go and "GIVE IT TO GOD!" I've included below, a poem that was written by me... 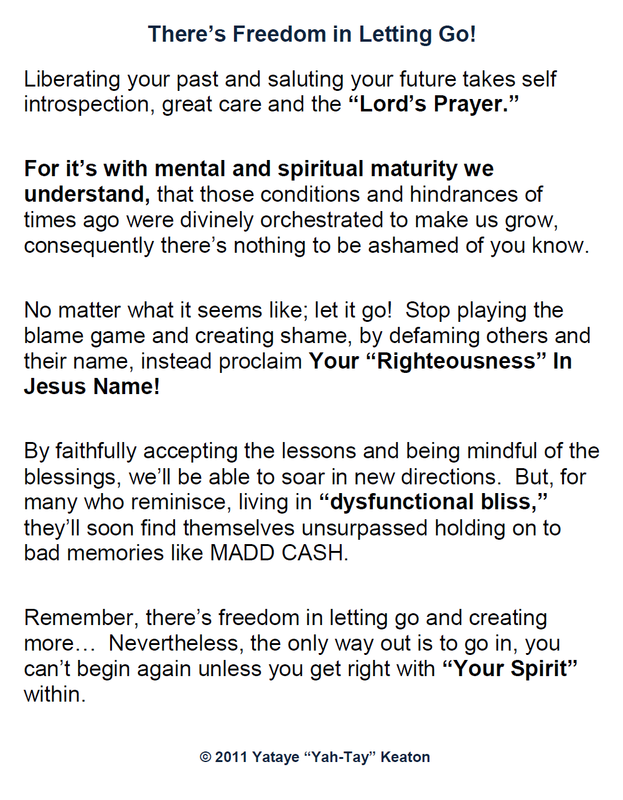 When you have "Reconciled with Your Past, Forgiven Yourself, and Have Asked Others (whom you've offended) to forgive you, knowing that you've done what's right, then there's nothing else for you to do but "LET IT GO!" Through my experience, I Sincerely Pray that this poem serves as a Blessing and a Wake-Up Call, because "There's Freedom in Letting Go!"